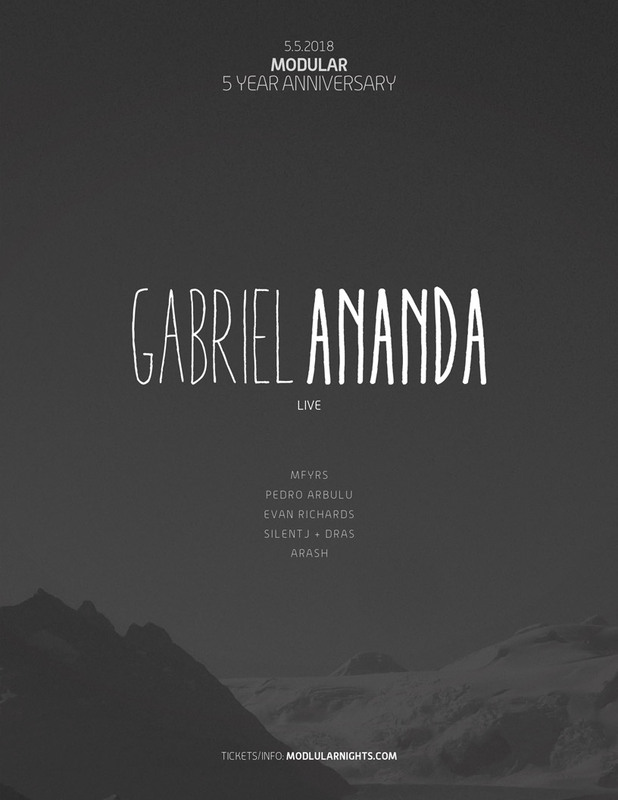 Gabriel Ananda (Live) San Francisco debut! The idea to do a 9 to 5 job, even going to school gave Gabriel nightmares already when he was a very young boy. His passion was always bigger than his discipline and his dreams were even bigger. He wanted to be really good in something and a little famous which would solve a lot of wishes like Independency, beeing loved by everybody, especially girls and money to have a good live. Thats why his passion for science, philosophy, electronics, sports and music often lead into complete obsession in one of these things. At the age of 15 he wanted to win the tour de france and cycled 60 to 160 km every day after school but ended his racing career after the first race, which ended up being too violent in his opinion. Then he wanted to take Richie Samboras place and ended up playing guitar for 2 years – 5 hours every day – but it didn’t do it for him either. Then he finally discovered his passion he would stick to for longer: Electronic music. Music you can create on your own seemed like a vast, undiscovered field surrounded by endless possibilities and the hope to be finally seen as a person, to be valued, make a living and find a place in an alternative society. In 1995 he converted his childhood room into a home studio. School became secondary. Instead, he used to create 2-3 different tracks per day in any style you can imagine. They sounded moderately good, but “when you really understand how music works, in any genre, you must be able to make one hit after the other, right”? His first fairly technoid releases in 1997 on Hör/Spiel/Musik and Utils were only recognized from the insiders. Back then, harder techno gave him a field of fascination, but he was always more drawn to melodies and inspired by beautiful sounds. Beginning of the 2000s he started to combine driving techno with his melodies, which was pretty uncommon at that time. He started to release on Labels such as Karmarouge, Trapez and Platzhirsch. In 2004 he produced a boundary-breaking track called „Süssholz“, a very melodic and uplifting tune. After several declines, the label „Treibstoff“ wanted it. A few weeks later the track was charted number one on the Groove Charts and became a must have on the DJs playlists at the time. In the following months, basically nothing happened. Spaghetti and Ketchup and a little job at a colognes clubs cloak- room still had to make his living. He was already about to lose hope, after 9 years of production without success, when a few months later it suddenly all shifted. Bookings from many countries came in and he shifted in no time from zero to a headliner. Totally overwhelmed by this unexpected situation, he would travel with a huge Live- Set-Up to his shows, without really understanding what was happening around him. In 2005 he surpassed all his prior releases with „Ihre persöhnliche Glücksmelodie“. Everything became bigger and the massive support from Sven Väth and Cocoon at the time kept pushing his career forward. In 2006 he made an international breakthrough with an EP called „Miracel Whop“, which contained „Doppelwhipper“ single. The track was all around, from „Underworld“ concerts to Ricardo Villalobos performance at the Berlin Siegessäule. In the upcoming years, he would play in nearly all noteworthy clubs and festivals, steadily with his huge Live-Set-Up until he completely exhausted decided to scale down his activities. He simplified his Set-up to a hybrid form, something between DJ and live act and reduced his shows. The focus began to shift from technical perfection to having more space and joy with the audience. In 2008 he founded his very own record label „Basmati“, which was meant to be a platform for his out of the box, experimental productions like the tracks „Hey Blop“ and „Smash“ for instance, which originated from his „Live Sets“. And precisely these tracks were the main reason for his success in the Netherlands. His sound was touching the hearts of the Dutch crowd, who understood and appreciated his music and knew how to join it with their lively (party) culture. It was a brand new boom that he was experiencing at the time, his converted Set-up offered him a much more intense connection with the audience and for the first time, he was able to witness, what was going on around him. A complete new energy and motivation would appear, which prompted him to give his career a new boost. Driven by the new experiences in music, he was developing his own style even further. His individual sound became organic, natural sound, influenced by Latino drums, with a life-affirming basic mood and unique groove, yoked together with melancholic melodies and influenced with the classical and pop sounds from his childhood. Even today he keeps growing with his music, where we can feel influences from dubstep and deep house, as well as a comeback to more abstract and positive melodies where driving techno elements take place. For Gabriel every performance is unique, he seeks for a peaceful interaction that is allowing people to discover the soundscapes and evoke on a journey of their own desires, dreams and emotions. Gabriel sees himself more as a deliverer of music than solely a creator. For him, performance is not a service, nor a grandstanding, but rather a gift. He feels the connection with people on an eye level, an experience with the music as an event in which he is equally a participant and a creator, just like every guest is. Precisely out of this moments a really successful „Soulful Techno“ radio show came to life in 2013. A podcast and a platform for carefully selected, soulful and unique, authentic tracks. The podcast itself generated an enormous feedback from listeners all over the world and eventually planted a seed for Soulful Techno music label and an event platform in 2016. His interests in science, philosophy, and many other things never disappeared. He made an education as a mediator, creates his own fashion, designs mechanical watches, is a hobby therapist and loves everything about breaking the boundaries of what we believe in. His deep interest into Burkhard Heims united field theory, his knowledge of psychology and spiritual living created a new way of seeing the world for him. The second part of his life will probably go deeper into these things as well. In the middle of 2017, we are able to count more than 300 of productions on over 80 releases, as well as countless remixes for artists like Coyu, Stephan Bodzin, Butch, Dominik Eulberg, Roland Klinkenberg or Maceo Plex, just to name a few.